On a regular basis you can ask yourself How do I do this or how do I get that and as you can't solve the problem you go to the search engine to hopefully find the answer. Well today I want you to focus on I Can instead of the How do I.
I believe you have the ability to flip the script on any situation, statement, problem or emotion to the better alternative. In terms of your business I know you want to succeed, &I know you want it so much that, you can actually forget that you are capable of doing things yourself. Its so easy to say how do I because we are becoming so used to turning to the internet for all the answers. Its not intentional but why try & figure out when, Google has all the answers. Of course there will be times when search engines or a blog will help. What I want you to start doing though, is to flip the script on what you need help with and solve it another way. Personal: My car needed break pads, so I went to my mechanic and he said he could not fit me in until Saturday. It was Monday so I started over thinking, what about school, shopping, my other uses for my car & what am I going to do. Then I calmed down and thought what can I do. I can start pricing up the break pads and get them ready for Saturday. I spoke to a friend who got his brother to ring his friend, who just happened to work in a motor shop to get a deal. I drove to the shop got the break pads and drove by my mechanic before heading home just to show him the ones I had purchased, & to see what time on Saturday. Well you know what happen, he said he would do it for me then and there. So within 1 hour my car was fixed. In that situation I decided to stop over thinking & do what was in my control, which was sorting out the car part. Business: I was looking at my activity over at LinkedIn and was thinking how I could get more people to come to my site. Then I stopped and said instead I can reach out to one person and help them as much as I can. I put a question out there and got many responses but one stood out. I started helping her, our conversation moved to email. She implemented what I recommended, she sent me her changes to see if she was on the right track and she was super happy with my follow up. I have now made a great connection with this lady and I know she will keep me updated on her business progress plus if she needs any help she knows where to go. How can I get more potential customers following me on Twitter? The how to is merely adding to your twitter account and if you do add more followers, guess what, a week later you can ask the same question. Unless you are new to twitter & have no followers, don't lose sight of those who are already following you. Have you thought that your followers are not customers because they don't really know you. Get to know them, help them out, start a conversation, get them interested in you and they will visit your site or store. Just start with one person. How do get more sales? I can work on my descriptions and make them more inviting. You can always work on the parts of your business that helps your customer's buying decisions. Today I can visit 5 blogs and leave thoughtful comments on posts that really interest me. Do you now see how flipping the script puts the control back in your hands. Let's carry on in the comments below, share something you can flip the script on, so you are back in control.. Thank you very much my friend keep in touch from INDONESIA. Ok..God Bless For You and Family. Janet, I LOVE this post! 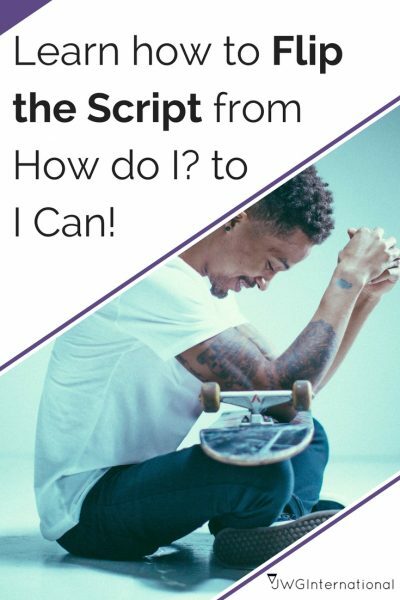 The idea of flipping the script from “How do I?” to “I Can” is simple yet brilliant. I wish I would have thought of this! It’s so true that we may not know how to do everything that we would like to, but we can do the things that are within our control. I recently started learning the art of calligraphy. I really have NO idea what I’m doing, and I’m tempted everyday to give up because I don’t know “how” to write calligraphy, but what I “can” do is keep reading the calligraphy book that I bought and practice a little bit everyday. That’s my example of flipping the script! I’m glad you LOVED it 🙂 We under estimate how much we can do all the time. I am loving your flip the script on your new calligraphy adventure. Do share your progress on your blog i would love to see. I love your advice in this article and I have already started flipping my script to get things done. Sometimes it’s hard to see your way out of a difficult situation, especially when others in your social circle tend to say things or do things that tend to discourage you. And this has definitely been happening to me lately. My life seems to be in a shambles to a certain few, but I see big opportunities with one door closing and a bigger & better one opening. Where not too very long ago I had that “how can I’ attitude and perspective on my life’s chaotic issues and now, I have an “I know I can” attitude because my hope is larger than my fear. I’m glad I found your best2keepitsimple site and stopped to read a bit, I am inspired! I’m glad you loved this post its become one of my favourites too. Even thoughyou have not had a easy road, you choosing not to stop you is the strength you always had in you. Yes others around you can be unkind but moving pass that with a positive look is hard but a great feeling when achieved. I am thankful that you found by blog and that i have inspired you. Thank you so much. Thinking of this I took the step of temporarily folding down my jewellery making business as I went to craft fairs, church and school fairs to sell. As when ever I went I hardly got people taking a look at my things-plus, I had lots of people asking either for discounts or asking why I was so expensive. As well as asking me to give away things at the end of the fair, some of the regular church markets were good at first but the longer I went the less I took. I didn’t want to take the attitude of one of the other stallholders who always told anyone who even went near her stall, how expensive her costs to make her stock were, how expensive her living costs were as I felt that was counter-productive. But was at a loss as to what I was doing wrong. I knew my suppliers were much more expensive when I began as I knew no better but I knew there was a link I did not have. I sorted suppliers, then looked to see what others were doing. I wanted to be different and keep my quality but had no idea how and didn’t know any other craft jewellers to speak to either. Well I found a group locally thanks to a combination of luck, they were on a TV programme and Facebook and found if I looked at the right type of thing for the place I was selling at I’d do better. I needed to learn to use less expensive materials but keep my design and making at the same standard. Rather than only working in sterling or vermeil with gemstones, or silver and gold fill/rolled gold and crystals. I could do just as well with plated or glass and could work just as well with crimped ends as carefully knotted silks, as long as I didn’t skimp on the quality of my work. I will be able to do much better when I begin to go out again and must remember that different things sell better at different places, that’s how I flipped my script. I am clapping and shouting yes you flipped your script and then some. I love that you dissected what you were doing and found how you could change it to work for you. Finding the right people for your different product range is so important. With not doing this or understanding this it can make you doubt and question your product, or even yourself. I’m glad you flipped the script & found a new group of like minded people to work with too. Keep me updated on your progress.